The Rainshower Cosmopolitan 160 shower set, with its stepped, sleek hand shower guarantees a lot of shower fun. The complete set includes a 600 mm shower rail, large hand shower and long shower hose, and is easily installed thanks to the GROHE QuickFix quick installation system. The brackets are moveable and thus make this shower rail ideal for installing it, using already existing drill holes. TwistFree prevents rotation of the shower hose and GROHE DreamSpray ensures a full spray and a uniform distribution of water to all spray nozzles. In each of the four spray modes you can choose from. But also after showering the set is practical in use. 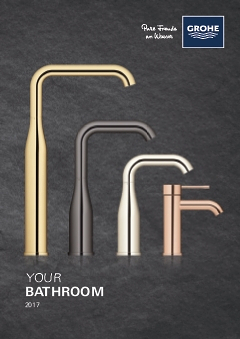 The GROHE StarLight chrome coating is not only robust and scratch-free, but also very easy to maintain. Wiping with a soft cloth is sufficient for years of shine.